Q. Why aren't the articles I saved to my folder in EBSCOHost still there? I saved articles to my folder while searching in an EBSCOHost database but when I continued my research later they were gone. In order to save items in your folder within EBSCOHost databases for future use, you must have created an internal account within EBSCOHost and be logged into that account when adding articles to the folder. Otherwise, the articles you add to the folder will not be retained when you close the browser or the session times out. To ensure your articles are saved to your folder, you must do the following: Once you are within EBSCOHost, you need to select "Sign In" from the list of links on the top right. 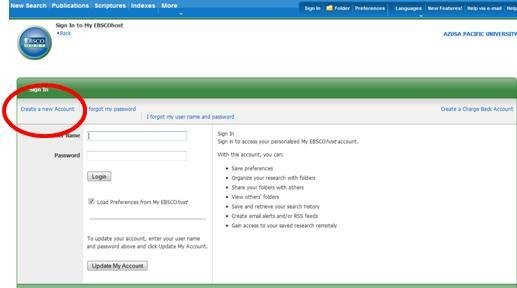 If you have already created an account within EBSCOHost, all you need to do now is sign in with your username and password, and you will be all set to start saving items to your folder to come back to another day. However, if you have never created an EBSCOHost account before you will need to click on "Create a New Account" in the sign in area. Follow the prompts for entering in your information, and when you are done click "Submit." Now you have created your own personal account within EBSCOHost and are ready to start saving items to your folder for future use. Just remember to sign in to your personal account the next time you come back to an EBSCOHost database in order to access your saved articles again.